Highly detailed pocket watch with 15 in. chain. 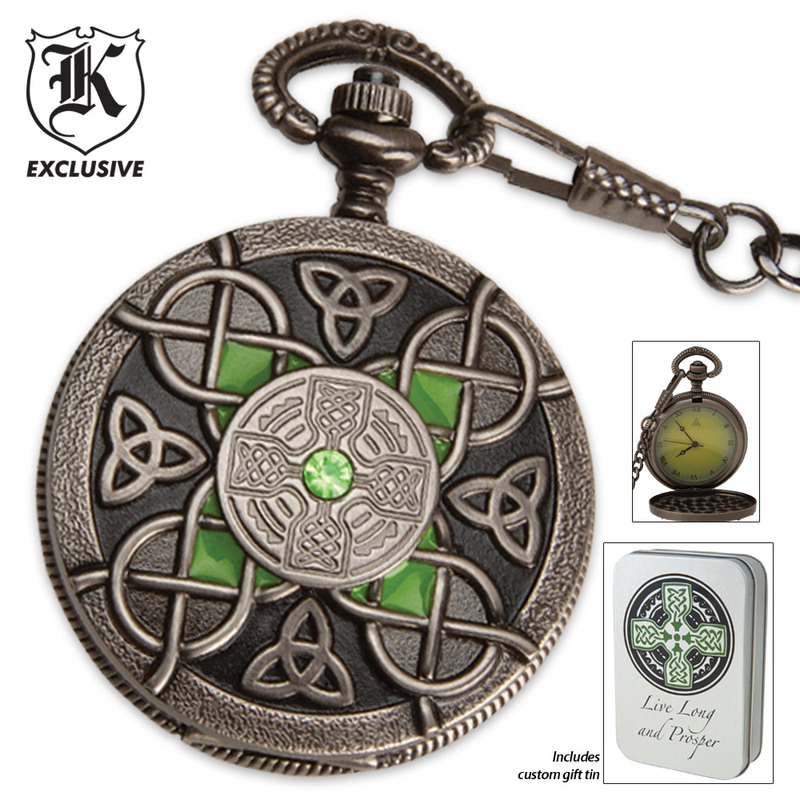 Crafted using top quality pewter, this unique pocket watch timepiece is perfect for displaying Celtic pride and heritage. 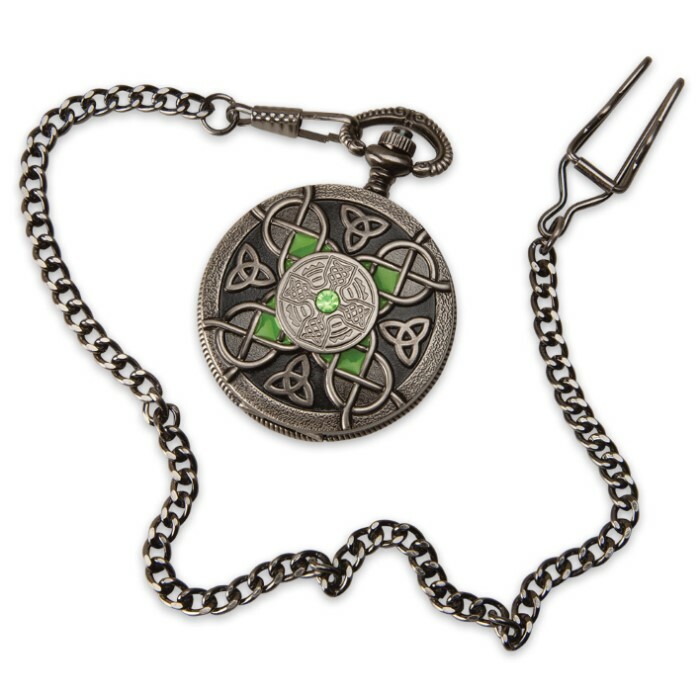 Features Celtic knots motif and a faux green jewel on the front. A matching Celtic Lighter is also available. Goes great with the celtic dagger and the matching lighter. Its a little small, picture made it look a little bigger. Overall very pleased with the purchase. This is a good buy for only $19. I gave it a four out of five only due to the fact that after some time of use (about a year in my case) the hing began to come undone and bent. It's nothing I can't fix to be sure, and it is a great piece of work for being a cheap pocket watch, but it does wear down over time and you can tell the hing is not the best. Again, not much of an issue a pair of pliers can't fix. If you like the look of this watch, it is worth it. It has actually been through a lot with me, so I am not surprised of the break down, and maybe that's the issue with it. No other part has suffered any wear and tear. It's a good value from true swords yet again! Good watch. Got it to go with my Scottish Kilt for the Highland Games. It gives me a more authentic look not having a wrist watch. I was surprised that it was battery powered but pleased any way. The watch is pretty good, I carry it everywhere. It is durable from what I've seen, I've had it for a while now. With the whole Celtic design, personally, they could have gone a bit darker with the gem, the pewter is okay, it's moderately shiny though. I appreciate the Roman Numerals, the watch keeps accurate time, overall it is well worth the money. It's got a good chain, and clip so if you fumble with it, it won't hit the ground. The Celtic design on the face of the gem looks good, but the green gem and the paint is glossy, it should have been darker, behind the Numerals it's a bit of a light green. Still very good, I'm not disappointed, it is far better than some of the pocket watches I've seen. So, thanks BudK, this is a good item, the only thing I didn't like about it was that the coloring was just a -little- off. this watch along with everything I order is or has been wonderful. I always get what i thought I ordered and my son LOVES it all. I was excited when I purchased the Celtic Pocket watch mainly because of the price. I had been shopping for a pocket watch only to find they were not to be found. 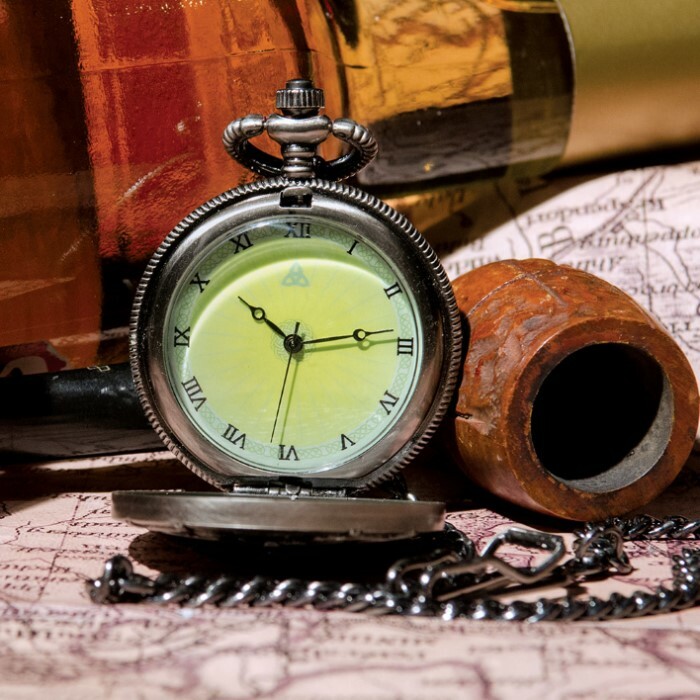 Antique pocket watches are expense and unreliable. The Celtic Pocket watch has never misses a second since I purchased it. Another reason I like the Celtic is that I carry a picture of my wife with me and every time I check the time, there she is smiling at me. Great product!! great items love them togeter great quality. Very nice a little smaller than I had in mind but worth the price. Very happy with this item.